Showing results for tags 'ap physics 2'. AP Physics 2 Essentials is an easy-to-read companion to the AP Physics 2 curriculum, featuring more than 450 worked-out problems with full solutions. AP Physics 2 Essentials covers all major topics of the AP Physics 2 course, including fluids, thermal physics, electrostatics, circuits, magnetism, optics, and modern physics. 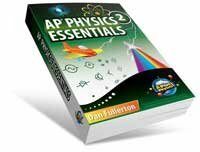 AP Physics 2 Essentials is integrated with the APlusPhysics.com website, which includes online question and answer forums, videos, animations, and supplemental problems to help you master the essential concepts of physics. This book is designed to assist physics students in their high school AP Physics courses both as a guide throughout the course as well as a review book to assist in end-of-course exam preparation. Its focus is on providing the bare bones, essential concepts necessary for success in the course in a straightforward and easy-to-read manner, leaving development of in-depth problem solving and lab work to the classroom, where it is most effective. In short, this is not intended as a substitute for a standard textbook or course, but rather as an invaluable supplementary resource. This book includes more than 60 AP-style problems to test your understanding and help prepare you for the AP Physics 2 Exam. Additional supplemental problems are available on the APlusPhysics website. Note: This is a license for a digital download of the PDF version for use by one person only on up to five electronic devices. This document may not be printed, edited, re-distributed, re-sold, or licensed to any other user. Once the file has been downloaded no refunds will be given. *AP and Advanced Placement Program are registered trademarks of the College Board, which does not sponsor or endorse this product. Walk-through of the 2015 AP Physics 2 Free Response Questions. Questions can be found at [url="https://secure-media.collegeboard.org/digitalServices/pdf/ap/ap15_frq_physics_2.pdf"]https://secure-media.collegeboard.org/digitalServices/pdf/ap/ap15_frq_physics_2.pdf[/url]. For more information, please visit APlusPhysics.com. *AP and Advanced Placement Program are registered trademarks of the College Board, which does not sponsor or endorse this work.